Soak all the dhals in water for about 3 hours. 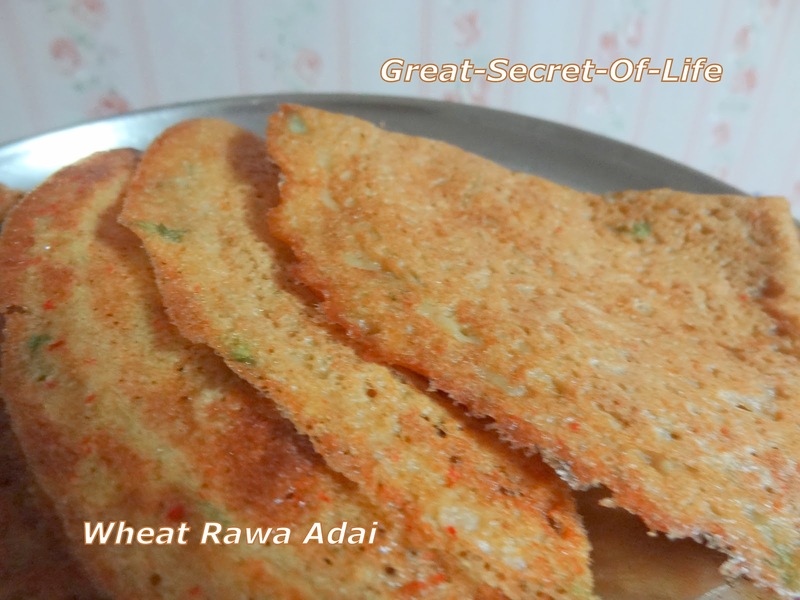 Soak wheat rawa in enough water (just to cover the rawa) for one hour. Wash the soaked dhals and drain the water. Add red chillies, Onion, Curry Leaves, asafoetida and salt. Grind to a coarse paste. Add the soaked wheat rawa to the dhal paste. Add little water if required to make the batter little thicker than dosa batter. Heat Dosa Tawa. Grease it. Pour a big ladle of batter in the middle of the tawa and spread evenly. Pour oil around the corners. Cook on medium flame. Flip over and cook other side also till it become nice brown. wheat rava adai Looks YummYYYY !! Looks perfect and healthy Adai... Keep rocking !